The rock that suddenly appeared next to the NASA’s Opportunity rover in the beginning of January turns out to have an irregular chemical composition for Mars: it has too much sulfur, magnesium and manganese, scientists say. 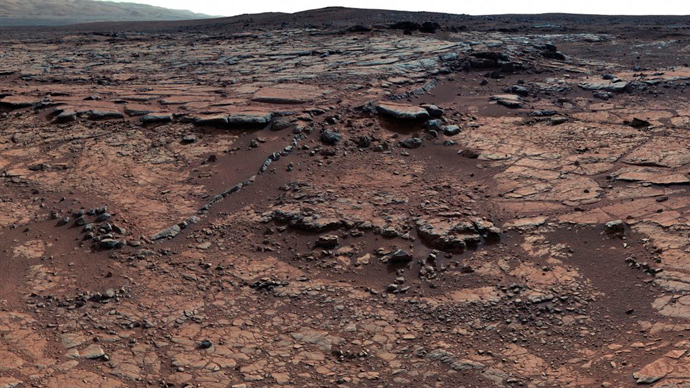 In particular, the rock has twice as much manganese as anything previously analyzed on Mars. 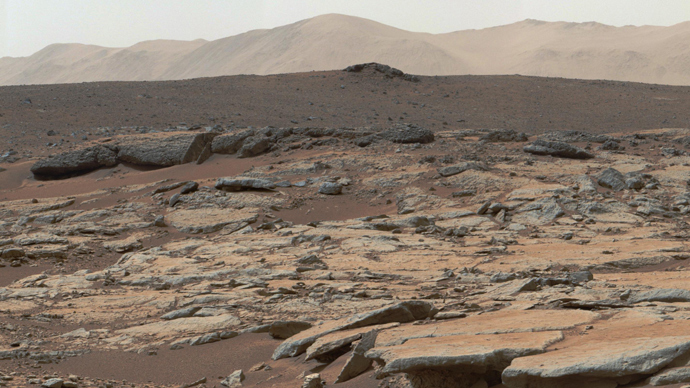 “Mars keeps throwing new stuff at us," said Mars Exploration rover lead scientist Steve Squyres. The rock suddenly appeared on photographs taken by the Opportunity rover on Sol (Martian day) 3540 or January 8 Earth time, according to NASA’s website. 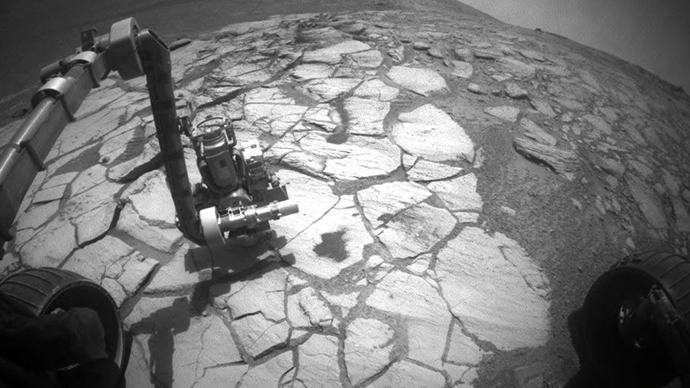 Photographs previously taken on Sol 3536 showed no trace of the rock. The body was named 'Pinnacle Island'. "It was a total surprise, we were like, ‘Wait a second, that wasn’t there before, it can’t be right. Oh my God! It wasn’t there before!’ We were absolutely startled," Squyres told Discovery News. So far, there are two theories about the rock’s origin. The first is that the Opportunity rover itself flipped the rock over as it rolled forward, while the second is that the mysterious rock just landed there after a meteorite impact nearby. However, the latter is highly unlikely, the researchers say. The Opportunity rover is about to celebrate its 10th anniversary on the Red Planet, with its stay originally scheduled to last just three months. The rover is equipped with a powerful set of tools to study Martian soils that may hold clues to past water activity on the planet. A decade ago Opportunity discovered hematite on the planet in the form of small concretions nicknamed 'blueberries', thus providing the first evidence of liquid water on the red planet. Meanwhile, other rovers on Mars’s surface are also contributing new findings. In December, the Curiosity rover discovered signs of an ancient freshwater lake on the planet that existed 3.5 billion years ago and may have supported small organisms for tens of millions of years. 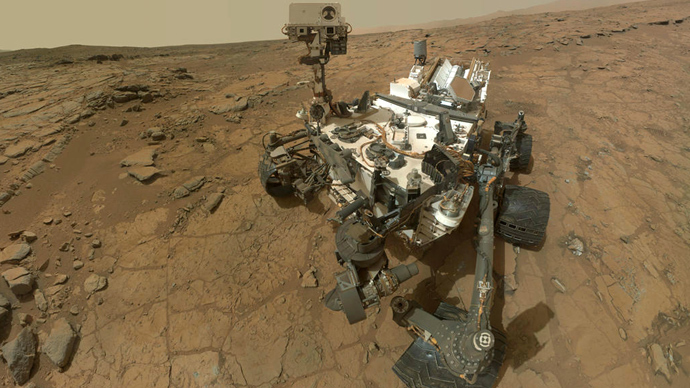 Back in September, Curiosity found traces of water in the Martian soil, too. 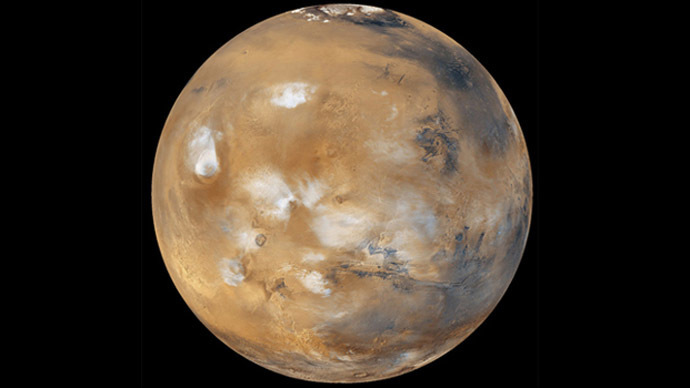 The report suggested that each cubic foot of Martian soil contains about two pints of liquid water, though the molecules are bound to other minerals in the soil.